Many people dream of taking a long road trip, but few actually make it happen. With the advice in this award-winning, information-packed, "how to" road trip guide, you will be leaving on your own great road trip adventure before you know it. Read more about this useful Road Trip Guide. The new second edition includes an updated technology section, an all new resource section, additional budgeting information and help for younger road trippers interested in sabbaticals, working on the road and/or "road schooling" children along the way. Phil and Carol White have traveled over 50,000 miles in the last several years, visiting all 50 of the states, all the National Parks in the continental US, and hundreds of places both quirky and fascinating. Articles about the Whites and their experiences have appeared in many publications including USA Today.com, The Boston Globe, The San Francisco Chronicle, and ABCNews.com. 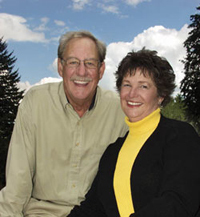 The White's have spoken to thousands of would-be road trippers at such prestigious conferences as AARP's "Life@ 50+" and The Great North American RV Rally. They are also frequent guests on radio and TV across the US and Canada and enjoy sharing their “can do” attitude and travel tips with people. Whatever road trip planning tools you’ve come looking for, we’ll have some ideas to get you going. We believe there is nothing more exciting than planning your road trip dream. Whether your road trip is for a few days, a few weeks, a month – or more, take a minute to look around our road trip guide – you’ll be glad you did. Where will your dream take you? (the White’s) Great American Adventure wasn’t perfect. The van needed repairs, Carol broke her ankle, and the digital camera bit the dust. … (however) the tone of the entire book is warm and encouraging, the Whites take an if-we-can-do-it-so-can-you attitude that comes through strong. Read what the media has said about Carol and Phil's Road Trip Planner.